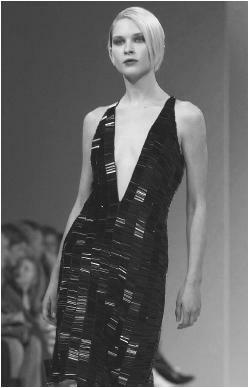 Nicole Farhi, winter 2001 collection: beaded evening dress. Marks, daughter: Candice; married David Hare, 1993. Career: Freelance designer for Pierre D'Alby, Bianchini-Férier, Elle, Marie-Claire, 1966-circa 1973; designer, French Connection, from 1973; introduced own label to coincide with first Nicole Farhi boutique, 1983; opened freestanding shops, London and New York, 1984, Norway, 1987; menswear collection introduced, 1989; opened flagship new York City store, complete with restaurant and bar, 1999. Awards: British Fashion award, 1989; British Design Council award, 1991. Address: 16 Fouberts Place, London W1V 1HH, England. Bloomfield, Judy, "Nicole Farhi Strengthens U.S. Connection," in WWD, 28 September 1988. "Din Adds Spice to French Dressing," in Design Weekly (London), 14July 1989. Martin, Rosie, "So Farhi, So Good," in Vogue (London), April 1991. Honan, Corinna, "Why Do So Many British Women Dress Like Tarts? Top Designer Nicole Farhi Reveals Her Contempt for Modern Fashions," in the Daily Mail (London), 2 October 1992. Fearon, Francesca, "Goodbye to the Changing Seasons," in the Herald (Glasgow), 11 November 1992. Dempster, Nigel, "Farhi's New Hare-Style," in the Daily Mail (London), 9 February 1993. Young, Lucie, "Design Notebook: Who's the Coolest of Them All?" in the New York Times, 19 August 1999. Deegan, Carol, "Five Questions: Nicole Farhi," in the Associated Press, 4 February 2000. My clothes are for women like me who are active, either because they work or simply live life to the fullest. The designs are understated but with tremendous style…never boring…and even when it is a fun garment, I like to keep the shape very simple. Nicole Farhi, autumn/winter 2001 collection. Marks and began designing for the company that soon became French Connection. "We went to India," she relates, "sourcing fabrics and designing textiles. This was 1973-74 and there was a demand for Eastern fabrics and embroidery." By 1983, when French Connection was floated on the London Stock Exchange, Farhi launched a company under her own name, backed by the now considerable resources of the larger label. In 1984, she wrote, "The clothes I was designing for French Connection were too constricting for me. They were very successful, but I wanted to design unstructured clothes for women." Unstructured design is a distinctive feature of Farhi's work, as is the importance of understatement, attention to detail, and subtle colors and textures: "My collections over the years have become more and more feminine…altogether softer, using layers of color and texture. I think a woman should express her sexuality…not in a blatant way, but subtly—perhaps just by using fabric that is pleasing to the touch." In winter 1989, Farhi launched her first collection for men, a move welcomed as a new development in British menswear. As Farhi explained at the time, "Many of the fabrics and shapes I had used for women in the past had been quite simple and 'masculine,' so it was not too difficult to make the transition." Both women's and men's collections express Farhi's Europe-based design philosophy. "Nowadays the way we live means less of a partition between day and evening clothes…. They need to be relaxed in the day yet sophisticated enough for the evening. We must mix them to suit ourselves. At last there is no dictation." There are a total of eight London Nicole Farhi shops, including those in Covent Garden, Knightsbridge, Hampstead, and the original at St. Christopher's Place, as well as concessionary outlets in many major stores throughout the UK, Europe, Japan, and Hong Kong. In 1989, Farhi won the British Classics category at the British Fashion awards and in 1991 was awarded the British Design Council award for Design Excellence for her spring/summer 1991 collection, the first time in five years the award had been given to a fashion designer. Business boomed for Farhi in the 1990s. In September 1999, she launched a 20,000-square-foot flagship store in New York City, showcasing her signature clothing plus antique furniture and flea market treasures from Europe, South America, and Madagascar. The 1901 building, once the Copa Cabana nightclub, is home not only to Farhi's menwear and womenswear, but home collection and to Nicole's Restaurant and Bar. Farhi ended a long romantic relationship, which produced daughter Candice, with business partner Stephen Marks in the late 1980s, although the two have continued to work together. In February 1993, Farhi married playwright David Hare, who wrote the film Damage and has directed at Britain's National Theatre. Even as she reigned as one of Britain's most successful designers, collecting an estimated £50 million ($80 million) in 1998 and dressing movie stars such as Judi Dench, Jeremy Northam, and Mary Elizabeth Mastrantonio, Farhi has remained low key, driving a 25-year-old Volkswagen Beetle and attending high-brow events wearing jeans. Her attitude toward the fashion industry is similarly practical: "I want to stop this nonsense of people saying there is a 'revolution' in hemlines or whatever," she told Corinna Honan of London's Daily Mail. "My advice is—ignore what the fashion magazines are saying. I wear jackets and sweaters that are 10 years old; I'm not worried about what people think. There are pieces in my collection that have been the same for five years."